Tenogenic phenotype in C3H10T1/2-BMP2 cells due to forced expression of Smad8 L+MH2. The parental C3H10T1/2 and C3H10T1/2 constitutively expressing the BMP2 gene were stably transfected with different Smad molecules as described in Methods. (A) Histological analysis of ALP-positive cells at 6 and 10 days after confluence (dac). Note the elongated tenocyte-like appearance of BMP2/Smad8 L+MH2–expressing cells compared with BMP2/Smad8WT–expressing cells. (B) Recombinant expression of FLAG-tagged Smad8 variants in C3H10T1/2-BMP2 cells. Western immunoblotting of cellular extracts of C3H10T1/2-BMP2 cells. Open arrowhead indicates a nonspecific band; filled arrowhead indicates Smad8WT and Smad8 L+MH2 domains. WB, Western blot. (C) Smad8 L+MH2, but not Smad1 or Smad5 L+MH2, elicited a tenocyte-like morphology in C3H10T1/2-BMP2. Histological analysis (ALP) and phase-contrast microscopy. All cells represent day 10 after confluence. 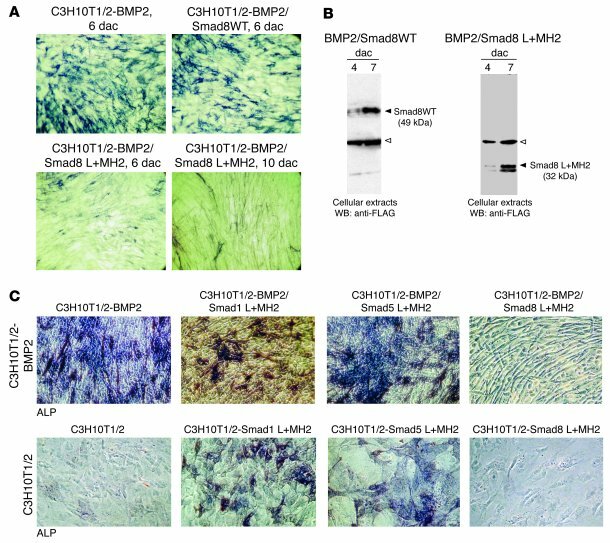 Top panels: In the presence of BMP2 all C3H10T1/2 cells underwent mesenchymal differentiation and extensive matrix development resulting in multilayer growth. At this relatively late stage of cultivation residual ALP-positive cells were observed embedded in matrix and on the top of the layer. The presence of coexpressed L+MH2 domains from Smad1 and Smad5 did not influence this morphology. The presence of Smad8 L+MH2 dramatically changed this morphology to an elongated cell phenotype. Bottom panels: Parental C3H10T1/2 cells expressing Smad1 and Smad5 L+MH2 developed an osteoblast-like appearance. Smad8 L+MH2–expressing cells did not possess a comparable osteogenic capacity. Also, development of an elongated cell phenotype was not observed. Magnification, ×40.